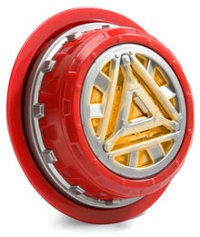 Loved Tony Stark’s Arc Reactor? Well, you too can turn into an instant Iron Man with the Iron Man Arc Chest Light from ThinkGeek. This glowing plastic replica of the power generating arc reactor from the movies will certainly seem to give you a new lease of life, never mind that you do not have a health condition to worry about like Tony Stark’s. All you need to do is clip on one of these puppies to your shirt, turn it on using a couple of AAA batteries and you’re good to go – it will glow like the real deal, and come with actual battle sounds, ready to unleash the kid within you. Oh, and you won’t need to be as rich as Tony Stark either, since this is going for just $9.99. You want a better cooler looking Ironman Arc Reactor Chest Light? Buy a glowing flexible strip you buy at 4th of July stands and shape it like a circle and tape it on your chest under your shirt. Way cooler, thinner and best of all, even cheaper. Maybe it’s a one time use but seriously, you going to wear it everyday lol! Eggxactly!